According to the Family Business Institute, whilst 88% of family business owners believe the same family or families will control their business in five years time, just 30% of family and businesses actually survive into the second generation, 12% remain viable into the third generation while only 3% operate into the fourth generation or beyond. Whether you have been actively planning for succession in your business or you are just starting to consider passing it to the next generation, the decision may be overwhelming. 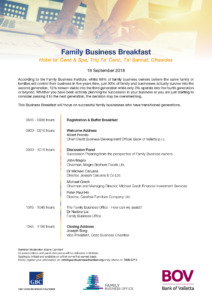 This Business Breakfast will focus on successful family businesses who have transitioned generations. Kindly note that seating is limited and available on a first-come-first-served basis.